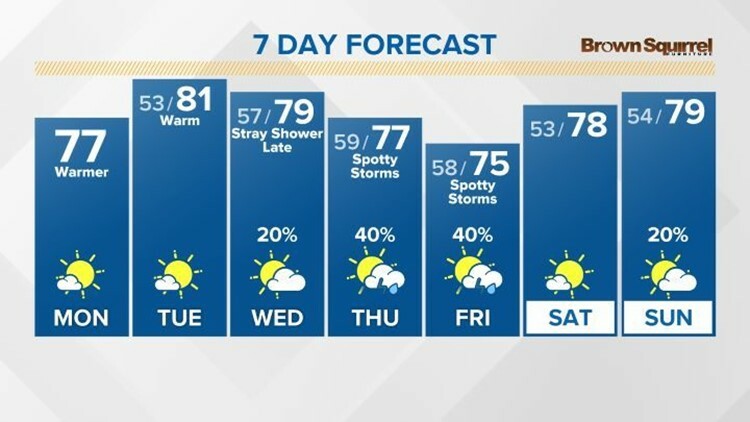 KNOXVILLE, Tenn. — Today: Just a few passing clouds with highs in the upper 70s. Lows will be in the middle 50s Monday night. Tuesday: A mix of clouds and sun. Highs will be in the lower 80s. Lows will be in upper 50s Tuesday night. Wednesday: Partly sunny with highs near 80 degrees. Clouds will increase late with a few showers possible overnight into Thursday. Lows will be in the upper 50s Wednesday night. Thursday: Partly cloudy with some scattered showers and storms. Highs will be in the upper 70s. Lows will be in the upper 50s Thursday night. Friday: Mostly cloudy with a chance of showers and storms. 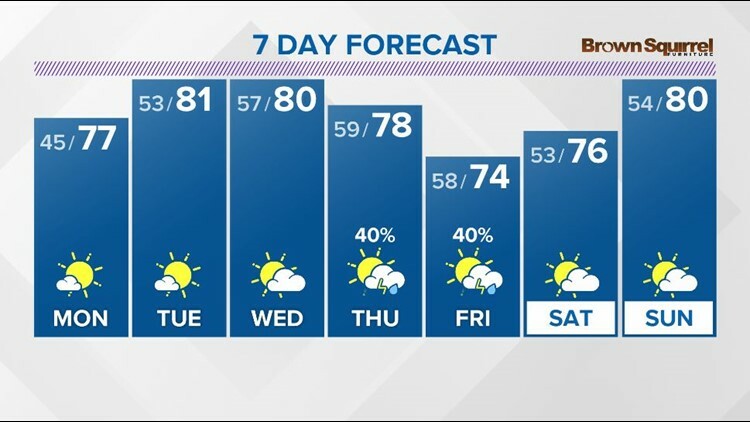 Highs will be in the middle 70s. Lows will be in the lower to middle 50s Friday night. Saturday: Variably cloudy with highs in the middle 70s. Low will be in the middle 50s Saturday night. Sunday: Partly sunny with highs near 80 degrees.